Looking for How to Freeze Asparagus - Easily! With Step-by-step Photos, Recipe, Directions, Ingredients and Costs in 2019? Scroll down this page and follow the links. And if you bring home some fruit or vegetables and want to can, freeze, make jam, salsa or pickles, see this page for simple, reliable, illustrated canning, freezing or preserving directions. There are plenty of other related resources, click on the resources dropdown above. If you like frozen asparagus in the winter, just imagine how good it would taste if you had picked a head yourself and then quickly froze it at home! It is also one of the simplest ways to put up a vegetable for the winter. Here's how to do it, complete instructions in easy steps and completely illustrated. The asparagus will taste MUCH better than anything you've ever had from a store. fresh asparagus - any quantity. I figure one handful per serving. Step 1 - Get the asparagus! Asparagus are of the best quality when they are tight, before the tips start to open. You can grow your own, pick your own, or buy it at the grocery store. Start with fresh asparagus - as fresh as you can get. Step 2 - Wash the asparagus! I'm sure you can figure out how to rinse the asparagus in plain cold water. Sort into sizes, by diameter (thick, say half inch diameter) stalks require longer blanching than pencil sized spears. Trim stalks by removing scales with a sharp knife. Cut into even lengths to fit your freezing containers. Get the pot of boiling water ready (about 2/3 filled) and a LARGE bowl with ice and cold water. Use one gallon water per pound of prepared asparagus in each blanching batch. Step 5 - Blanch the asparagus. large spears (a half inch or more in diameter) 4 minutes. These durations are just long enough to stop the action of the enzymes and kill the bacteria. Put the vegetables in a blanching basket and lower into vigorously boiling water. Place a lid on the blancher. 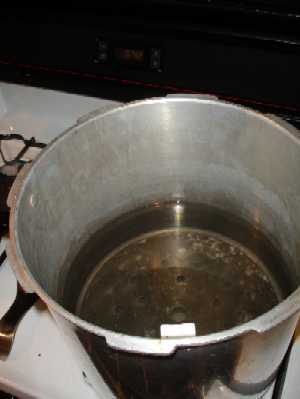 The water should return to boiling within 1 minute, or you are using too much vegetable for the amount of boiling water. Start counting blanching time as soon as the water returns to a boil. Keep heat high for the time given in the above. You may use the same blanching water several times (up to 5). Be sure to add more hot water from the tap from time to time to keep the water level at the required height. Cool asparagus immediately in ice water. Drain the asparagus thoroughly (this shouldn't take more than a minute). After vegetables are blanched, cool them quickly to prevent overcooking. Plunge the asparagus into a large quantity of ice-cold water (I keep adding more ice to it). A good rule of thumb: Cool for the same amount of time as the blanch step. For instance, if you blanch the asparagus for 3 minutes, then you should cool it in ice water for at least 3 minutes. Freezing keeps asparagus safe to eat almost indefinitely, but the recommended maximum storage time of 12 months is best for taste and quality. The quality of the frozen asparagus is maintained best in a very cold freezer (deep freezer), and one that keeps them frozen completely with no thaw cycles. Excluding any air from inside the bags which leads to freezer burn, by using vacuum-sealed bags, is also important to maintaining quality. The blanching times presented are was based on the Ball Blue Book Guidelines and "So Easy to Preserve", 5th ed. 2006. Bulletin 989, Cooperative Extension Service, The University of Georgia, Athens. Revised by Elizabeth L. Andress. Ph.D. and Judy A. Harrison, Ph.D., Extension Foods Specialists. Blanching (scalding vegetables in boiling water or steam for a short time) is a must for almost all vegetables to be frozen. It stops enzyme actions which can cause loss of flavor, color and texture. Blanching cleanses the surface of dirt and organisms, brightens the color and helps retard loss of vitamins. It also wilts or softens vegetables and makes them easier to pack. For home freezing, the most satisfactory way to heat all vegetables is in boiling water, although in a few cases, steam blanching makes more sense. Use a blancher (a large pot with a seive / strainer pucket insert) which has a blanching basket and cover, or fit a wire basket into a large pot with a lid. I've frozen asparagus but it seem so limp and fell apart. Any idea why? In general, up to 9 months in a ziploc bag in an ordinary freezer, and 14 months in a deep freeze in a vacuum packed bag. After that, they asparagus won't make you sick; they just won't taste a s good.